Apple's tvOS 10.2 is preventing third-party AirPlay streamers from sending audio to the fourth-generation Apple TV, and it is unclear at this time if the functionality can be restored. Software such as Rogue Amoeba's Airfoil lost the functionality after the update. Apple is now requiring the Apple TV to require device verification from AirPlay streaming devices —which can only be provided by Apple hardware. As a result, Apple hardware using native AirPlay routines are unaffected by the issue. It is unclear if this is an accident, or an intentional change made by Apple to block the third-party utilities. The block remains in the tvOS 10.2.1 beta. The second- and third-generation Apple TV are unaffected, as they have not been updated recently. Airfoil allows Mac or Windows users to stream any audio source on the host to anywhere in a local network. Besides AirPlay compatible receivers, iOS devices or computers can be targeted for the stream as well, utilizing helper applications. To connect to the fourth generation Apple TV, it uses the now-blocked AirPlay. A blog post by Rogue Amoeba addresses the issue, saying that the company was researching the problem, and seeing if it could be circumvented in an update to AirFoil. 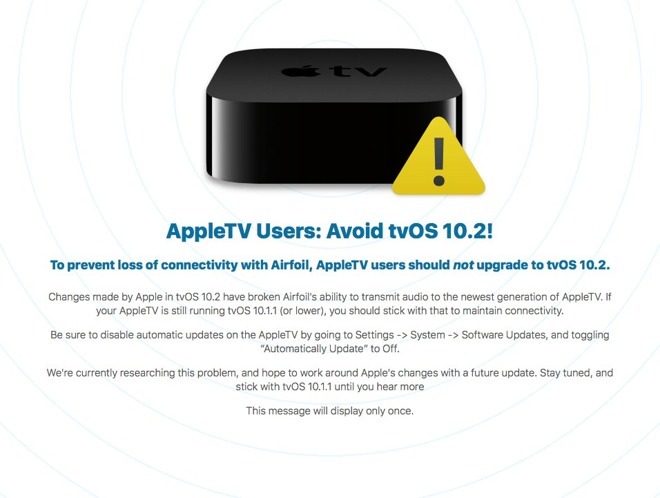 The company recommends that Airfoil users avoid tvOS 10.2, and retain tvOS 10.1.1 as long as possible. The update to tvOS 10.2 was released for all users on Monday, and includes accelerated scrolling in apps, support for the Device Enrollment Program, and better mobile device management in general. It also offers VideoToolbox, a framework that lets developers tap into hardware-accelerated encoding and decoding.